In this week's Bullseye interview segment, we hear from the best new late-night host: John Oliver. His HBO show Last Week Tonight rules, and you can often get the best parts for free on YouTube. Let's go! You can hear the full interview using the SoundCloud player above. You can also jump to the parts we've highlighted using the time codes shown at the beginning of each snippet. Jesse Thorn: When you’re doing a weekly show you are obviously not as timely as a daily show, and so it gives you a little bit of a different perspective. Did you think when you were developing this show about what you would do differently when you were making jokes once a week rather than making jokes every weekday? John Oliver: Yeah. It’s very different. I mean, we’re still developing. We haven’t really done anything yet. We’ve only done three shows, so yeah, I still don’t quite know what the show is or how we should be making whatever it becomes. But yeah, there’s a mental clarity that comes from doing a show every day because you don’t have any time to wallow in your failure. When I was sitting in for Jon [Stewart] over the summer, I realized there was a certain point of the day that I could wallow in failure, and it was walking from the desk at the end of the show, to the rewrite room where we were going to start talking about tomorrow’s show. So I had about 45 seconds to mentally beat myself up, and so that had to be quite a tenacious 45 seconds, and then you just kind of have to get on with it, and now there’s a different mental process doing it once a week. So every part of it is different and is difficult in a different way. Jesse Thorn: It’s Bullseye, and I’m Jesse Thorn. 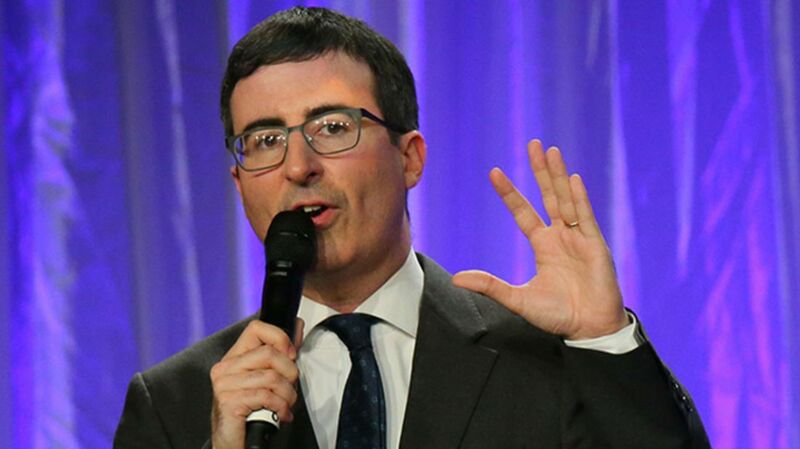 My guest is political satirist John Oliver. He’s been a correspondent on The Daily Show with Jon Stewart and recently landed a late night show of his own on HBO. When you first came to the United States, how much time had you spent here? Or I should say, when you first came to the United States to work for The Daily Show? John Oliver: No time. Zero time. I had not been here before. Jesse Thorn: How did it compare with what you thought it was going to be like? John Oliver: I thought New York would be like a mixture of the Friends set and countless Woody Allen movies, and to a certain extent I was not disappointed. So yeah, you kind of project so much from all the cultural exposure you’ve had to New York and to America, and I kind of fell in love with it straight away. Not just New York, but everywhere I went, America was a confounding place, especially because it’s projected as a... you kind of project yourself as a nation, or we do, to play fast and loose again now, like a united front to the world. I remember every time you watch the Olympics you see Americans crying during their national anthem, waving their flags around, and you assume as a member of the rest of the world that all of those Americans think the same thing about something, which is of course ridiculous. The fact is, at least two of them probably have completely differing views on everything. And so yeah, that’s what I loved...the complexity of America is one of the things I loved the most about it. Martin Short and John Oliver attend The Night Of Too Many Stars Live Telethon on March 8, 2015 in New York City. Image courtesy Getty Images / Stephen Lovekin. Jesse Thorn: What was the first place that The Daily Show sent you that was way, way outside New York, to do a piece? And I ended up talking to him while he was ordering something, and he refused to believe that I had never seen or fired a gun before. He just physically refused. He said, “There’s no way that’s true. How old are you?” And I think then I was 29, and he said, “Do you want to hold mine?” And I said, “No. Absolutely not.” This cannot be my first time with a stranger in Chillicothe. This can’t be it because at this point I still think there’s a thing in my head that I might do something terrible with it. Jesse Thorn: I’m always surprised when American exceptionalism becomes a political issue in the sense that it is an accusation hurled against many politicians. Jesse Thorn: That they insufficiently believe that America is the greatest country in the world. The problem is when you take it one step further, and where you’ll get like this President saying, “America is the greatest country in the history of the world.” That’s where you want to go, “Whoa there. Whoa.” In the history? That is a much bigger discussion. Jesse Thorn: Well, it becomes a sort of fight. (L-R) Terry Gilliam, Michael Palin, John Cleese, Eric Idle, John Oliver, and Terry Jones pose for a photo backstage at the 'Monty Python And The Holy Grail' special screening during the 2015 Tribeca Film Festival. Image courtesy Getty Images / Stephen Lovekin. Jesse Thorn: I only recently learned that you met your wife at the Republican National Convention. John Oliver: I did. I did, yeah. I did. Jesse Thorn: Can you describe to me the circumstances? John Oliver: Well, I was there...it was the 2008 election and so we were shooting at the RNC on a layer of the convention center that we were not supposed to be on because that’s where all the people that you have any interest in interviewing are, so we would put our camera equipment through with the caterers’ equipment each morning and then we would find this back exit, and we’d usually have a few hours of interviewing people before we were chased out of the building. But I was concerned because I was on a visa back then. If you get arrested on the visa, you are gone, you’re done. So I could never get arrested on field pieces which can be problematic because you kind of do want to take it up to that line and beyond it sometimes, just for some jokes that’s where the most interesting thing is. It’s something that is not strictly allowed in the legal sense. And yeah, my wife was in the Army. She’s an Iraq War veteran, and so she was at both conventions with her veterans' group, and when they saw us getting chased by security, they hid us in their little booth, and then the security guards flew past, Keystone Cops style, and that was it. I didn’t see her again for like six months or so, but yeah, that was it. That was where I met her, in the least romantic place on earth. Whatever the opposite of a romantic story is, that’s what it is. You can subscribe to Bullseye With Jesse Thorn via iTunes or any podcast player you like. It's also on various NPR stations across the country. You can also hear the complete interview on SoundCloud.